I still see the C code explore issue in this version. Is this in you working list or I need to paste the sample code again? My PHP.DEF will not work with switch anymore. E.g. I have this two control structures. foreach works and switch not. I tested the most other control structures. All work except switch. 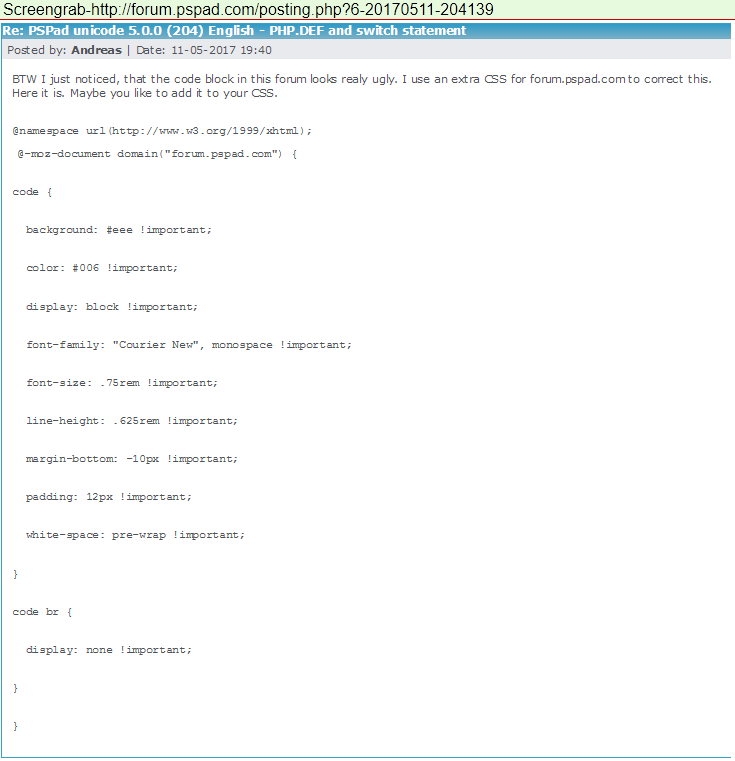 BTW I just noticed, that the code block in this forum looks realy ugly. 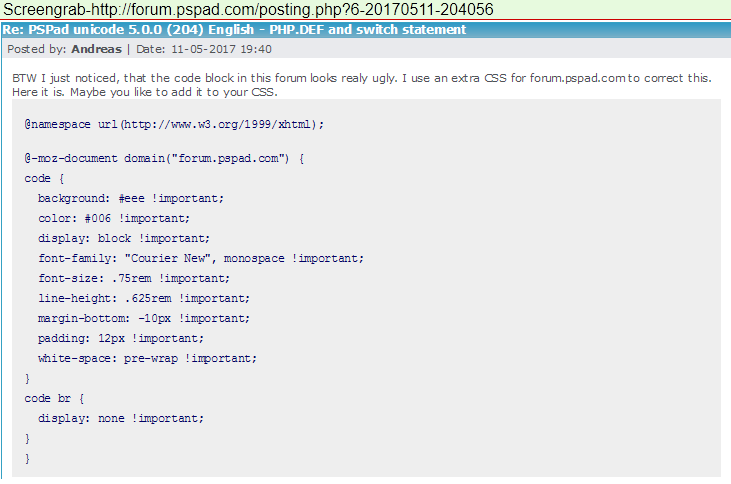 I use an extra CSS for forum.pspad.com to correct this. Here it is. Maybe you like to add it to your CSS. OK. I removed definition for code from line pre,code and add your definition for code and code br. Edited 1 time(s). Last edit at 2017-05-11 19:26 by pspad. When I compared your CSS, I found the problem. In original CSS was line-height for CODE defined as 1.2em, this creates big spaces between lines, There were no additional line breaks. You also could have tried to leave the original and paste it at the bottom of the default.css. Further down rules overwrite above rules (if the selector is strong enough). Second solution is, you add another line into the HEAD of your HTML to load a second CSS-file. I removed it already. Link to mozilla, all !important e.t.c. No, the problem are the BR tags. They are not neccessary. Normaly code comes into a PRE tag, this will show text as is. Here code is in CODE tag. But with CSS you can set it to act like a PRE tag - white-space:pre-wrap;. The second magic is to hide the BR tags - display:none;. Normaly line-height gets no unit - line-height:1.4;. Means 140% from elements font-size. 1.4em also means 140%. 1.4rem means 140% of browsers default font-size (rem = root em, normaly 16px (x 1.4 = 22.4px). Sure. Will check this, thanks a lot. Find in Files still has the problem with not showing the selected text in the Text to Find box when a longer version of the selected text is already in the drop-down list of previously searched items.